You are such a good Mama to do this on your own but your tale of the day was so entertaining! I'm sure the boys will remember it for a long, long time. Wow I have never seen a pumpkin patch like that ! Remind me not to show these pictures to my boys !!! This patch has so many wonderful activities! I love the spider web. JDaniel loved the corn maze. Aww man our pumpkin patch doesn't have all that.. I feel jipped . Your boys are so adorable. We love th pumpkin patch. Yours has some really neat things for the kids. what a great pumpkin patch!! you got some great pics of your boys too. I'm glad you all had some fun times (despite the meltdowns). Sounds like those three wore you out. I haven't been to a pumpkin patch in years but when I went years ago, they would charge you $10 for all the pumpkins you could carry out of the field in one try.... no going back. It was fun to see who could carry the most. The last time I was in a corn maze, a dog had been there before me and I was the lucky one who tramped in dog poop. Yuck! 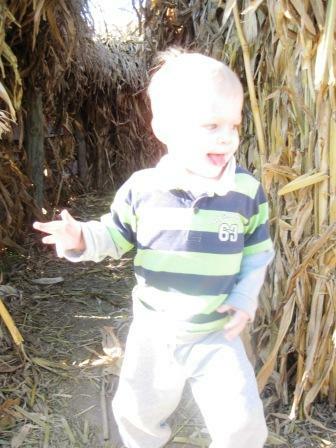 Love the pic of Reid running out of the corn maze. My 18-year-old is still going to those things. Such fun...when the kids aren't crying! Looks like a very fun time for the kiddos. What a great set up they have at this place. too cute, but yes, i can imagine you were exhausted! My favorite part has to be picking out my very own pumpkin! What a fun day you guys had! You are such a good mom...and, those boys are the cutiest! Thanks for sharing your day...have a wonderful weekend! Hugs! I really don't miss field trips with my boys as toddlers. But your post reminds me that that's normal for the age, right? Looks like a nice one - a bit better then ours. One family got lost in our corn maze and had to call 911. Take a pole and a flag next time the news said. Good idea. 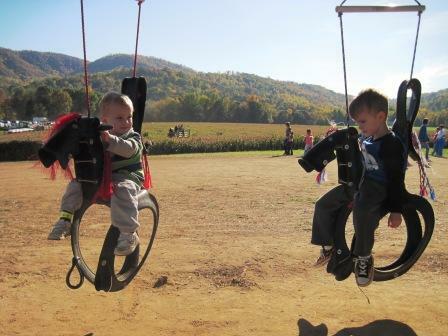 Hooray for pumpkin patches! My dumb friends and I went to our local one at night to go thru the corn maze. There were no maps. We were never seen again......almost! For having no backup, you did marvelous!! And managed to get great pictures, too. I think you have learned to be a top notch multi-tasker! Gosh, I don't think we have anything this elaborate here. 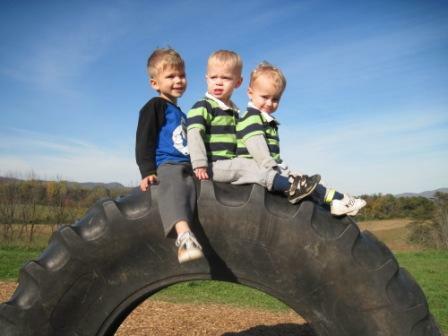 I love the pic of the boys on the big tire, and the spider web story is TOO funny!!! No matter what happens, you write with such a wry sense of humor, you always make me laugh. I got a letter in my e-mail saying that my e-mail delivery had failed, and it showed me my comment from your last post!!! Did you get my comment? Weird, because it was on your blog, not through e-mail. Oh wait, your comments go through your mail!!! I hope it isn't messed up? You are one brave woman to do that on your own....or maybe crazy. Looks like the boys enjoyed themselves though. Ha! I just finished putting together my pumpkin patch post that I'll publish in a couple of days. I too went without my husband! :) You have lots of neat things there. It would be fun to take the kids to a different one! I bet they were all worn out by the end of the day! Btw, I forgot to say that I'm your newest follower! Oh, you poor thing! I laughed about the corn maze fiasco -- sorry! i am exhausted just from reading!! this must be done when you are young and somewhat able to keep up. they are cute and i am glad they are yours!! i posted a picture of the cupcakes today....if you want to take a peak. imagine my spider-web cupcakes with your rings, that was the plan!! Great pictures of the pumpkin patch! 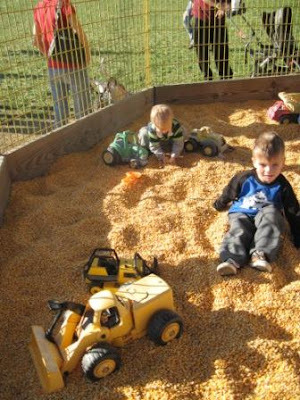 I laughed out loud at your very truthful thought on how the corn play area will be "around" for weeks to come! Been there, done that! Hey, I want to go to your pumpkin patch! 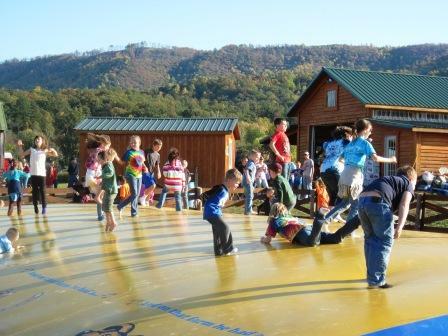 Ours was fun, but we didn't have a jumping pillow or giant spider web. Awesome. Wow! That is one great place to go to! My kids would love that place. Thanks for taking us on your adventure alone with the boys! You were very brave girl to go it alone! I know the children had a blast. It showes you have patience un-ending. Great pictures! I love that one of them on the big tire. I completely TOTALLY could relate to your going at it alone. I have to do that all the time & man oh man does it wear you out. Luckily my hubs got to go this year, saves my sanity for the next 3 events I have to go alone. LOL. I agree great pictures! It looks like such a fun place to go and that picture of all three of them on that big tire is just adorable!! This post made me laugh. It's fun (and busy) going on outings like that alone huh! Looks like a great annual tradition to have. Love all the pictures! 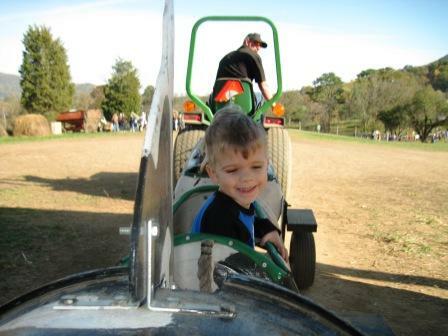 The pumpkin patch trip looked like so muuch fun! The photos are aforable! Making memories to live in the heart forever,,,thats what we do to. My mommy takes me to the pumpkin patch. Can you imagine? 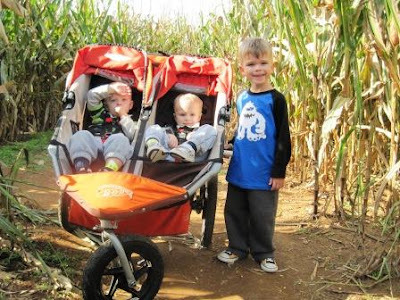 You were brave, I still am not good at venturing out with both kids to an event on my own. Love that shot on the huge tire! I am having problems with gmail but I want you to know how much I appreciate your comment on my blog. You are very kind. That looks so very cool! 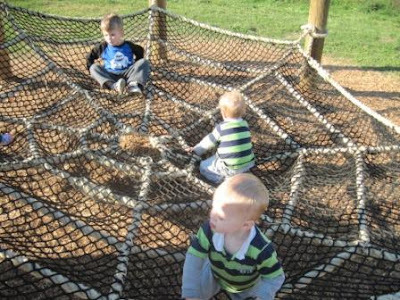 I like the big spider web thing! Great photos! We took our grandsons to Jeter Farm a few years ago and they loved it. Petting zoo, hay ride, pumpkin patch to get a free pumpkin and also the corn maize. Really enjoyed ourselves! Cute pictures! I don't think I could manage the pumpkin patch alone. Way to go!